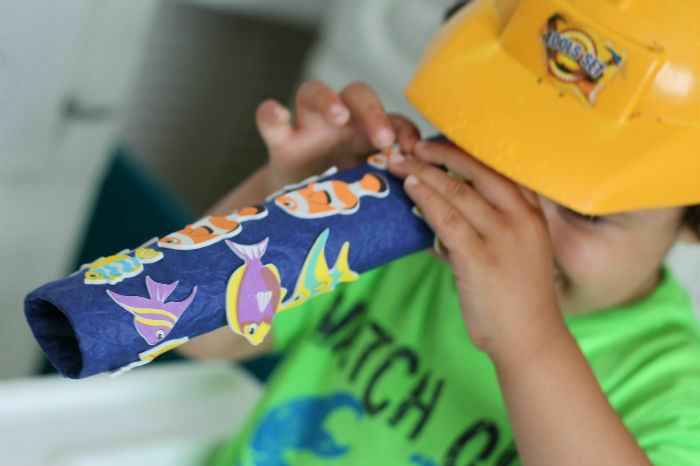 The boys love to play pretend, and often use an empty kitchen roll as a telescope so we decided to make some a little more special and decorate them for a fun and easy make a telescope craft. 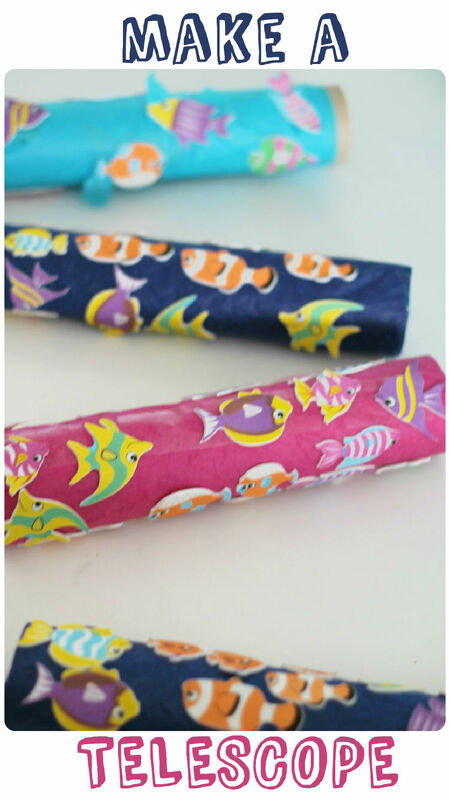 Once your kitchen roll is fully covered then the kids are ready to stick and decorate! 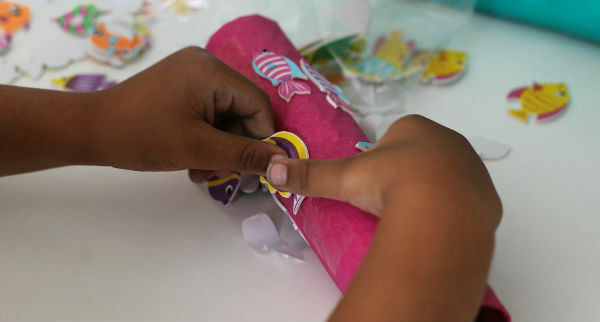 Younger children will need help with the tissue wrapping, and older ones may be able to do those steps themselves too. Peeling the backing off the foam stickers is a great fine motor activity and the boys loved deciding where to place all their fish. Mr Z recreated his own scene from Finding Nemo using some of the clown fish stickers. We had just finished watching right before this activity so they were even more enthusiastic about the fish theme! For the younger ones its an ideal chance to talk about colours and sizes as we choose the different fish. 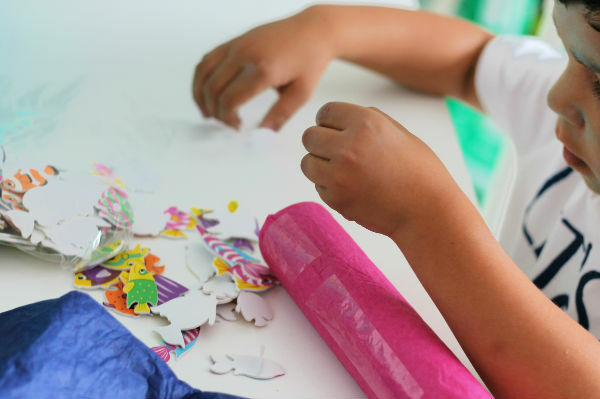 You could also get your children could to decorate the fish in patterns and sequences to sneak in a little maths if they would enjoy that. 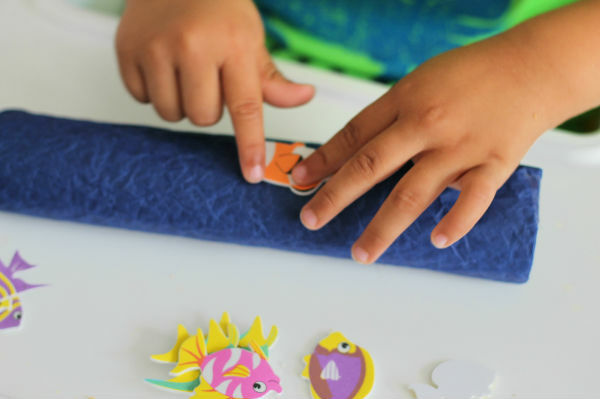 You can modify this activity using whichever types of foam stickers you have available, but I love the tropical fish theme. It’s so colourful! 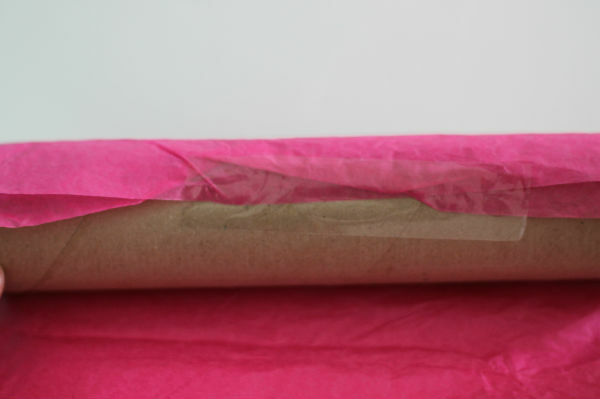 Mr T chose the pink tissue paper for his telescope and I think that one looks particularly bright and summery! Once the kids are done making the telescope they are ready to play straight away, with the foam stickers there is nothing that needs to dry so they can run off and play, spying many things through their telescopes for plenty more imaginary and gross motor play. You could also adapt this to make a simple kaleidoscope by adding a panel at the end with glitter and sequins. I’m meaning to give that a try so when we make it, I will of course share the results with you! These look lovely. Mister B declares every toilet roll and kitchen roll a telescope in our house and does sometimes sit down and decorate them a bit. I’ll have to try a bit of tissue round them first to make them a bit more colourful! That look fab! Love how you make it look so pretty! They are so pretty! Will have to give this a go over the summer we always have loads of cardboard tubes lying around! These look great and also lots of fun to make! We’ve got lots of left over wrapping paper, so easy to repair or change if they get damaged or ‘played out’! They look great and so simple for children to make. 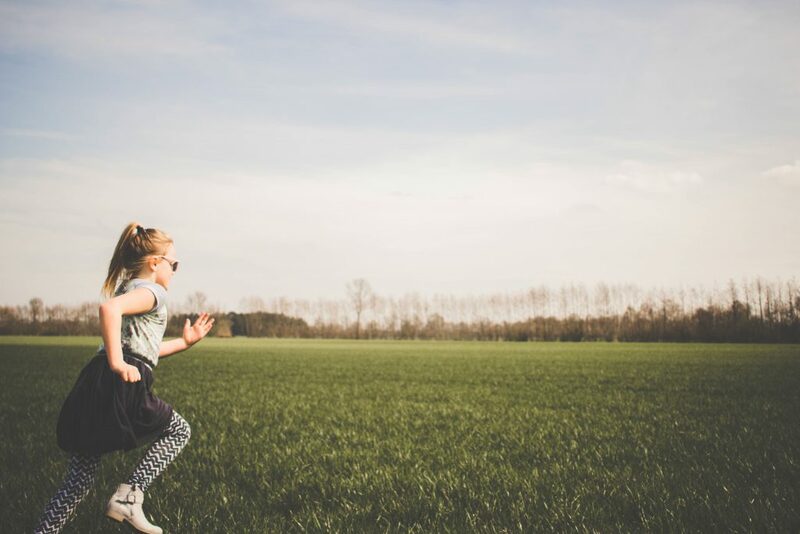 Karen Bell recently posted…Should children take risks? TwinsplusTwo recently posted…Impaired Executive Functioning – time to ditch the briefcase? Great idea and so simple but easy for children. They look so effective. Good for recycling as well. This look like a lot of fun and suitable for any age! 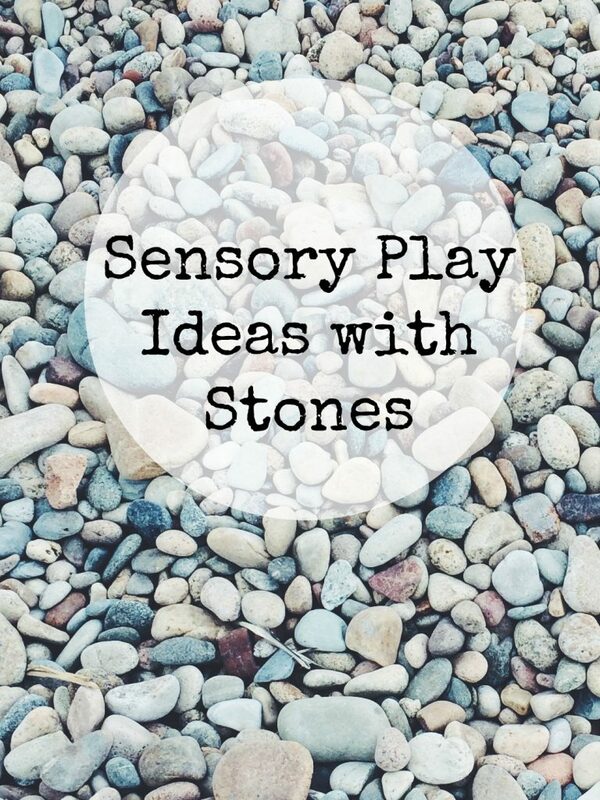 I am so unimaginative and it always amazes me how people come up with such simple ideas that kids love – I will definitely be giving this a try over the summer. Thanks for linking up to the parenting pin it party!